The first tweet that the fake account pushed out was addressed to "all the young people". That tweet went viral with almost 3,00,000 likes. 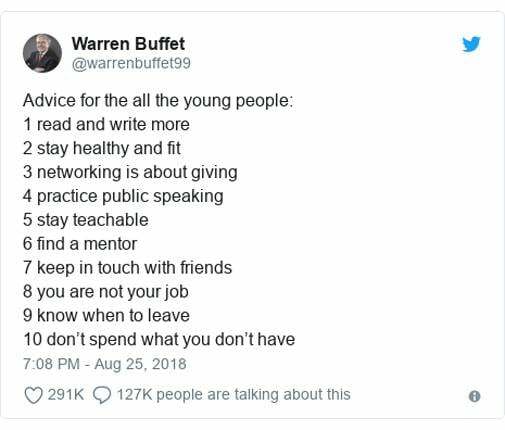 Whether Warren Buffett doles out life advice or not, there is someone trying to change the world with one tweet at a time on his behalf. Not only are these advice very profound, anyone would mistake them to be straight from the boss of Berkshire Hathaway. Sadly, however, Twitter upon discovering that it is a fake account has since then suspended it. The fake Buffett account by the handle warrenbuffet99 dispensed some really golden tweets. The first tweet that the fake account pushed out was addressed to "all the young people". It stated tips like "read and write more", "stay teachable", "find a mentor" and "know when to leave" amongst others. That tweet went viral with almost 3,00,000 likes. Another explained what the definition of being cool is. As the fake account explained, it is "showing up on time", "admitting you were wrong", "being a mentor" and "learning and using other people's names" and more. 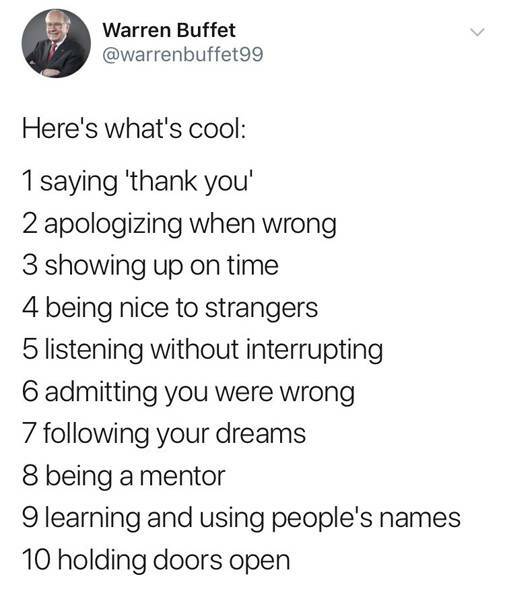 The tweets followed Buffett's style of wholesome quotes. Quite understandably, the Internet was only warming up to the fake Buffett's motivational tweets before the account got suspended. Upon its suspension, Twitterati has been discussing how wonderful the account was. Some apparently even mistook it for the real Warren Buffett. However, there were all the tell tale signs of a fake account. For instance, there was no blue tick mark on the handle. Let's be real, how can Warren Buffett's handle not be verified? Moreover, the spelling of Buffett's name was wrong. It read Warren Buffet. The handle's activity was, too, focussed only on motivational tweets. It's little hard to imagine Warren Buffett not finding enough content to talk about. The real Warren Buffett has, on the other hand, not tweeted since 2016.